Co-Optimus - News - Hit That Ramp Fitty! Blood on the Sand on sale for $9.99! Hit That Ramp Fitty! Blood on the Sand on sale for $9.99! Who said the deals have to end with Black Friday or Cyber Monday? Newegg is currently selling the Xbox 360 version of 50 Cent: Blood on the Sand for $9.99. Yes...$9.99! Sadly the PS3 version isn't on sale. There's simply no excuse to not own this years best Rap/War/Arcade/Action/Historical Co-Op game. It's a wild romp through the desert with a friend in 2 player online co-op. The game is seriously more fun than it should be. Perhaps you forgot about our review? Thanks Tino and Kat for the heads up. 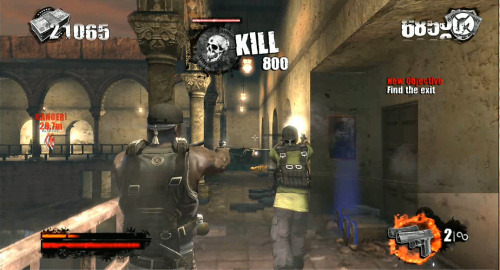 Co-Op Knockout Blow - "50 Cent: Blood on the Sand" Better than "Killzone 2"
New 50 Cent Game Might Be Good? Page created in 0.4533 seconds.